Control of Juvenile Delinquency pays particular attention to the important projects that have fundamentally shaped the thoughts and actions of persons concerned with youth crime. The third edition contains recent extensions and replications of previously examined projects and sensitizes students to the conditions that must be met to determine whether or not a project has accomplished its goal. The author offers a rigorous and logical justification of his recommendations for the future, linking what has been done in the past with what should be done in the future, especially his provocative argument in favor of doing less rather than more to juveniles in trouble with the law. Careful scholarship, exceptional writing, and over 100 illustrations, tables, and boxes make this book essential for a wide range of courses in sociology, criminology, criminal justice, public policy, administration of justice, social work, psychology, and law enforcement. 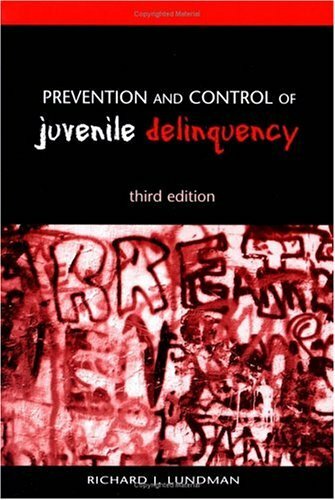 Prevention and Control of Juvenile Delinquency now offers students an even more detailed understanding of this important topic.